When the gray wolf was eradicated from Yellowstone National Park in the 1920s, more was lost than just the noble and fascinating predator. The park’s entire ecosystem changed. Now, nearly a dozen years since the wolves returned, the recovery of that system to its natural balance is well underway, say ecologists William Ripple and Robert Beschta of Oregon State University. “We went out to the park and we cored the trees and studied the tree rings which show the annual growth, and we were able to age the trees that are still there,” Ripple says. The tree ring analysis indicated that the aspen, which usually regenerate themselves by sending off new shoots rather than by producing seeds, had stopped producing new trees during the first half of the 20th century. Ripple and his colleagues subsequently discovered other changes. In some areas, willows — small, scrubby trees that grow in wet areas along stream beds — were starting to grow taller, because they were escaping predation by elk. In other areas, however, the willows continued to be heavily grazed upon. 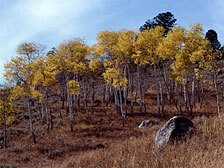 The same patchy changes were also seen with cottonwood trees, which also grow along streams. “The more I looked at it the more I could see that what is going on may be an ecology of fear,” Ripple says. “The theory goes like this: the browser — in this case the elk — need to make behavioral decisions and tradeoffs as to how much time and energy to put into eating food versus how much time to be staying in safe places.” Those decisions affect where the animals concentrate their feeding efforts, and therefore the distribution of the vegetation they eat. “What we started noticing is that the plants were doing better where the terrain might favor the wolf a little bit more than the elk,” he says. 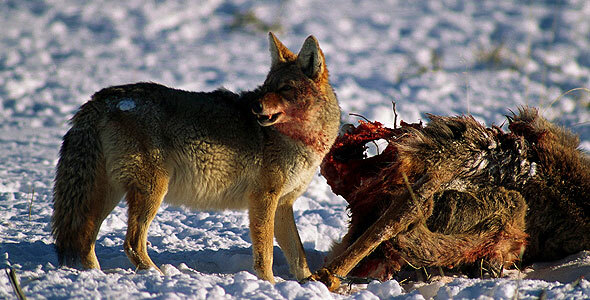 For example, the elk might browse less in areas with poorer visibility (more dangerous to the elk because they can’t see if wolves are on the scene), or regions littered with heavy debris (a risk because it becomes an impediment to escape in the event of an attack).